May 21: Section E is Ready for the Season! Today was the final day of work in my area before the thruhikers arrive. 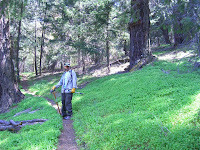 Since last June the PCT here has been the target of much brushing, tossing, sawing, trail rebuilding and treading. 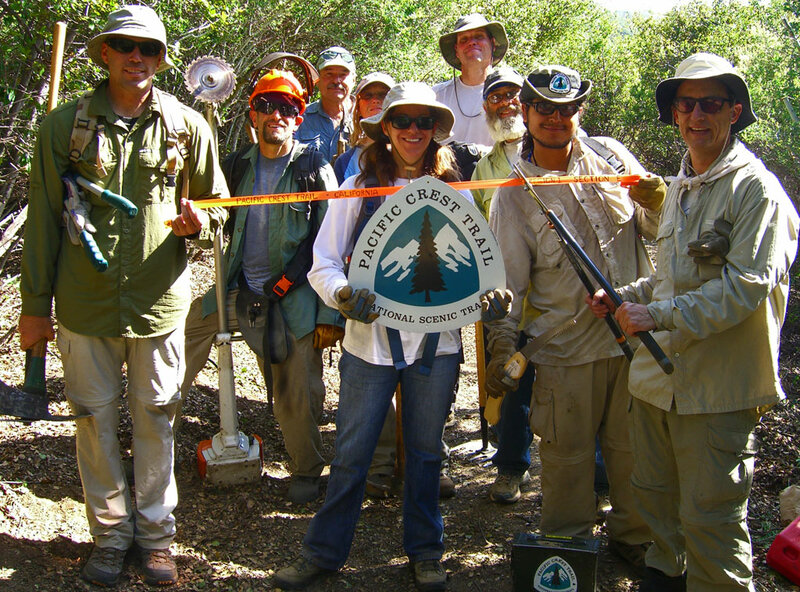 So with Pete Fish on Sawmill Mtn cutting the last of the blowdowns, and this excellent crew of volunteers working to cut back brush in San Francisquito Canyon, today marks the completion of Section E readiness for the approaching herd of thruhikers. To celebrate the work of all Sec. E volunteers over the past 11 months, the crew posed for this makeshift ribbon-cutting photograph. 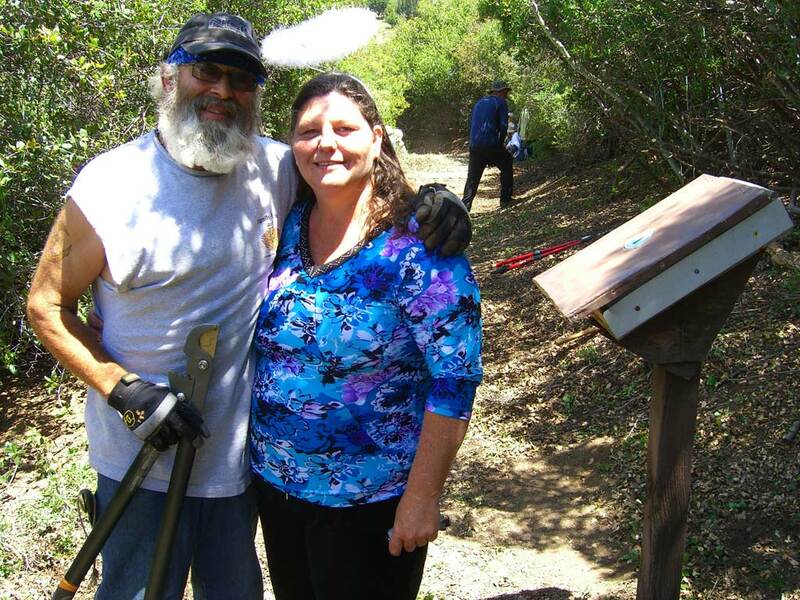 It was a great day with a fun crew and perfect weather, and I also snapped the attached photo of local "Trail Angels" Joe and Terri Anderson of Green Valley next to the register box. After our day of hard work, we joined Joe and Terri and several thru's for grilled chicken and Taco salad at the Andersons; a good time was had by all. Congratulations and thanks to all who helped maintain Section E for 2011. On May 8, Section Chief Dave Fleischman and I walked from Bear CG to Burnt Peak Junction and cleared the trail of remaining debris. There was only one tree that we could not cut out, push away, or otherwise remove, and that one is easy for hikers to get around. And Pete Fish plans to get out on May 21 with a chain saw to clear that one. We also apparently just missed Pat Aubuchon's Trail Boss crew, but we did find evidence of their work near Burnt Peak Junction. Great work, Pat, and please thank the scouts for us. 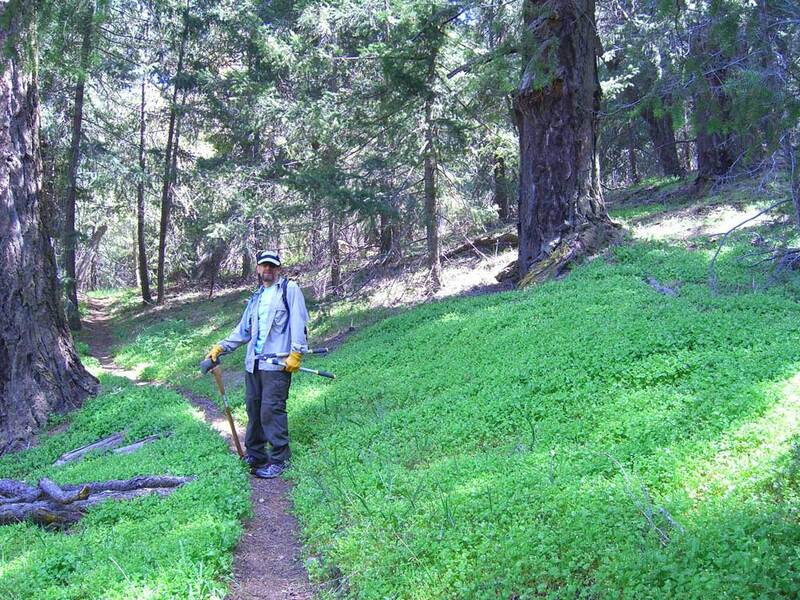 But the trail is now 100% snow-free, very green, and ready for 'The Herd' of thruhikers to arrive soon! 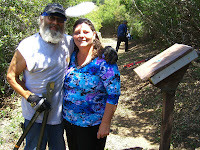 PCTA volunteers will be out for a day of brush removal and treading in San Francisquito Canyon on May 21. We'll meet at the Green Valley Fire Station and after shuttling a short distance up the road to the PCT crossing, we'll walk southbound on the trail, just up the hill, to the work area. To sign up for this project, send me a note at hikevv@gmail.com.